How To Make Lisa Roukin’s Raw Chocolate Mousse Cake. Hello friends, today I have a very yummy Raw Chocolate Mousse Cake to share with you from Lisa Roukin. A silky mousse cake with a crunchy base and the wonderful flavours of chocolate and coconut. Recipe and image courtesy of Lisa Roukin My Relationship With Food Cookbook. Line the base and sides of 20cm non-stick spring-form tin with parchment paper. Place the pistachios, blanched almonds and desiccated coconut into a food processor and pulse until a chunky sandy consistency. Place into a clean bowl. Add the dates, lemon juice and salt to the food processor, blend until smooth. Add the pistachio nut mixture back into the food processor, and blend until it forms a ball. Place the nut and date mixture into your prepared tin, press down firmly on the base and one inch around the sides and place in the freezer. Remove the coconut milk cans from the fridge, turn them upside down and open the ‘wrong end’ up (the milk will separate from the cream in the fridge). Pass the coconut milk and cream through a sieve (you only want to use the hard part of the coconut, discard the milk for this recipe). Spoon into a food mixer or use an electric hand-held whisk. Beat for about 4-5 minutes, stopping occasionally to wipe down the side of the bowl. Melt the chocolate over a water bath for one minute then add the date syrup and custard powder. Leave to cool then add the cream. Slowly fold the cream mixture into the chocolate, mix well (keeping 2 tsp of the whipped cream aside). If the chocolate gets hard and gritty when folding in the whipped coconut cream, don’t panic, just place the bowl back over the water bath and stir until smooth. Remove the nut base after 20 minutes from the freezer. When the chocolate mixture is smooth, pour into the nut base. Smooth out the chocolate mixture. 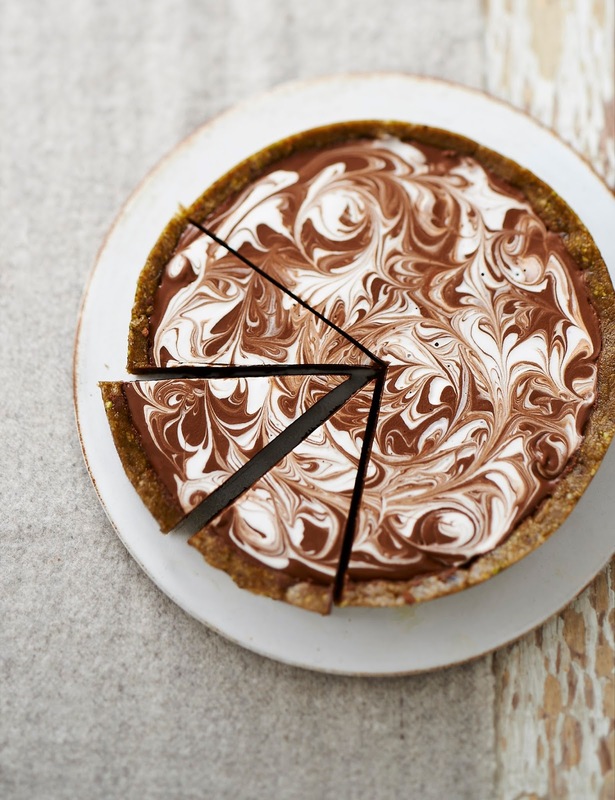 Drizzle 2 tsp whipped coconut cream over the top of the chocolate mousse and then, using a fork, carefully mix up the coconut cream into the chocolate to get a marble effect. If you LOVE chocolate as much as I do, then this is for you. Yes, it is possible to prepare the chocolate mousse from only a couple of ingredients without, dairy, cream or eggs! Make sure you refrigerate the cans of coconut milk and cream overnight to solidify and separate. What do you think of this How To Make Lisa Roukin’s Raw Chocolate Mousse Cake post? How To Make Lisa Roukin’s Bircher Autumnal Muesli. How To Make Lisa Roukin’s Moroccan Granola. How To Make Lisa Roukin’s Dried Fig, Pecan & Dark Chocolate Oat Bars. How To Make Lisa Roukin’s Oven Baked Corn Flake Chicken Breast with Salsa. "Sweet Chili Beetroot And Ricotta Filo Tarts, Nigella Seeds"
"How To Make Day Radley’s Tea Loaf With Butter"